In the spirit of continuing the Thai-related posts (somewhat to lighten the mood, in view of the current dire state of Bangkok’s, presumably? ), allow me to venture where no man has gone to before. Piping hot Tom Yum Soup with Seafood, but somewhat lacking in the fiery & robust departments, and the dipping sauces at Kaneng’s. 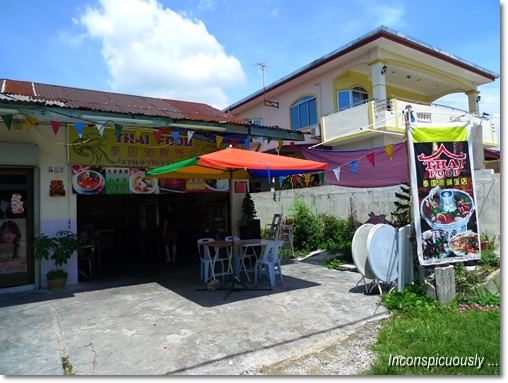 There is this unassuming shack of a Thai restaurant (IF you can even call the place THAT!) 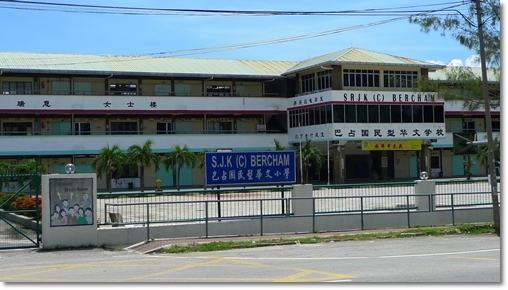 in Bercham, situated directly opposite of Bercham primary school; SJK (C) Bercham, Ipoh. No ads, no brochures, almost zero publicity, and guess what? Even without a PROPER SIGNBOARD!! The place is run by a couple (the husband being a local, and the wife being a Thai from Bangkok) in their 40’s, or 50’s possibly, and has been around for more than a decade! But they started the business in Ipoh Garden East (in the premise named KK Coffee Shop formerly housing the now ‘defunct’ Nakhon Pathom Thai Food), then subsequently moving to this place on Lorong Bercham 8. Serving a mix of authentic Thai dishes such as the perennial favourite of many; Tom Yum Gung (or in this case, a mix of various seafood), Thai-style Steamed Fishes (from RM13/USD4 onwards), Thai salads (the usual Kerabu Chicken Feet, Kerabu Mango, and even glass noodles salad), fried rice (Belacan, Pineapple, Tom Yum etc) and even Pad Thai (Thai style fried rice noodles) …..
Look for this primary school on your LEFT, and you’ll see the Thai Food signboard on your immediate RIGHT, once turning into Lorong Bercham 8 from the main road. On that scorching afternoon, I was out with Jason in search for food around Ipoh. He was setting his eyes on trying the new (alright, almost a month’s old now) Tutti Frutti frozen yoghurt kiosk at De Garden, but no idea on where to have a substantial lunch prior to that. Hence, I remembered a post by Simple Girl ages ago about this ‘authentic homecooked Thai food‘ somewhere opposite a school in Bercham. If the calendar, pictures, and condiments do NOT remind you of Thailand, tell me I’m not hallucinating. Rather easy to locate, but somewhat out of the radar for out-of-towners (even Ipohans, I believe), this Thai Food restaurant is named “Kaneng” (in their business registration cert, not printed on their banners or signboards). The man named Mr Tan was a lovely chap, constantly attending to our needs and apologizing for the delay in the service. Understandable, considering we were their first customers of the day (they open from about 12pm onwards, right until 10pm), and they were in the midst of preparing their kitchen for the onslaught of customers. Maybe not. For Mr Tan explained that the place is not doing as well even on weekend afternoons, no thanks to the sweltering heat. People tend to prefer air-conditioned outlets than sweating profusely under the zinc roofs, complete with fiery bites of chillies and spices. Fish Cakes served with Thai chili sauce. Browsing through their menu, which comprises of photos inserted into a clear folder, complete with prices and names of the dishes, we unanimously agreed that the food served here is comparatively cheap. From RM4/USD1.30 for a plate of fried rice, to the more ‘premium’ dishes of steamed fishes at less than RM20/USD6.30 per serving. The Fish Cakes (Tod Man Pla) were starchy, and not the best that I’ve tasted. 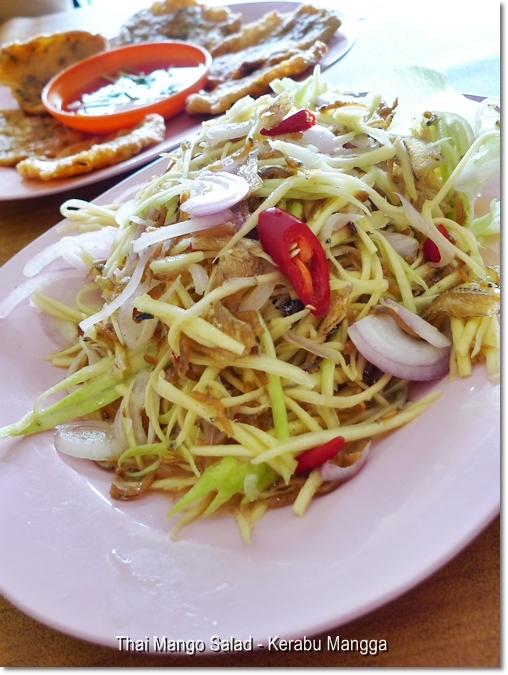 Even the inclusion of finely-chopped kaffir lime leaves did not manage to elevate its taste a notch higher. I still prefer Thai Xiang‘s version which was meatier, and tasted superb with the dipping sauce. The Tom Yum Soup was passable, definitely better than those average wannabes (at those Thai-Malay warung, especially), but still paled in comparison to Ah Wong’s version (which was, and is still the BEST in Ipoh, but sadly not operating anymore), Thai Xiang‘s spicy rendition, and some restaurants’ version of the famous robust soup from Thailand. The individual portions of rice and noodles make great, simple and cheap meals especially on days when you’re dining alone. The Pad Thai here resembled the local’s Char Kuey Teow (fried flat rice noodles with eggs, prawns and cockles), albeit with cubed beancurd, and its Thai counterpart’s condiments; Chili flakes, crushed peanuts, sugar and pickled chillies. 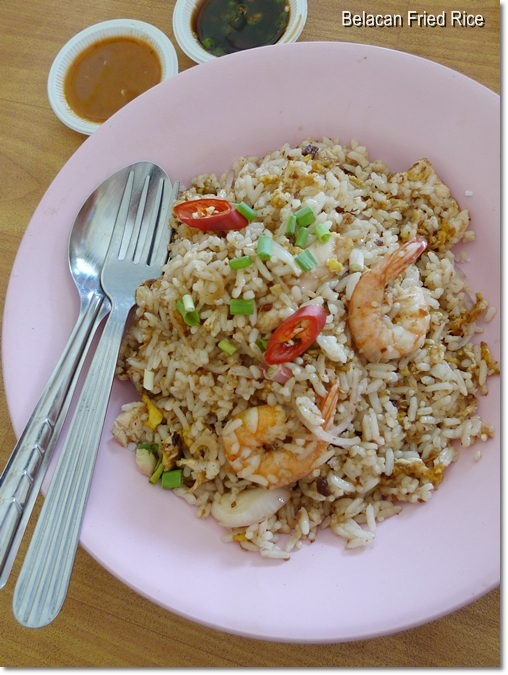 The Belacan Fried Rice was okay, being neither here nor there, for I don’t remember seeing an ‘authentic’ Belacan Fried Rice in Bangkok, Hatyai or even Betong before. And the front of the shop, sandwiched between a saloon, and a bungalow. The meal came to RM30/USD9.40 for two, including drinks. We definitely over-ordered a little, for we were struggling towards the end of the meal. Portions were more than ample for two, so be warned. Although this may not be the BEST Thai Food there ever was in Ipoh, it sure is one of the first fews! Yes, and in Bercham, Mr Tan laid claims that they’re the FIRST. 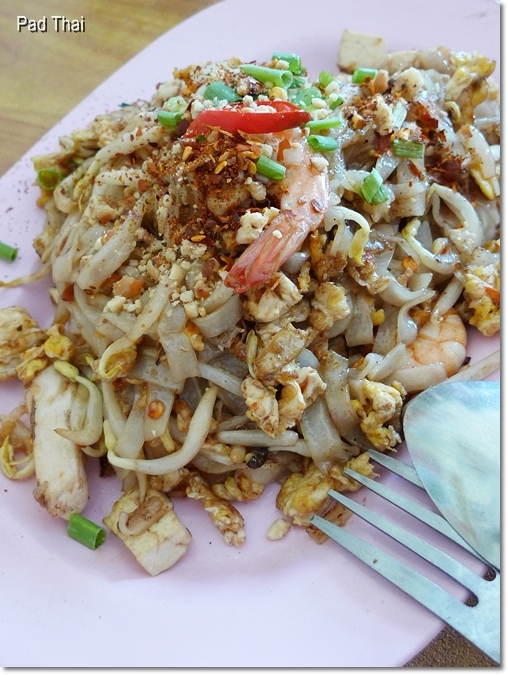 Plus, they get their ingredients from Thailand (Hatyai, especially) from time to time. And seriously, nothing beats a pleasant feast brimming with spices, herbs and bursting-rich flavours on a hot and humid day. (Directly opposite of Bercham primary school). Here’s an attached GOOGLE MAP to the place. Black Canyon Coffee @ Jusco Kinta City …. erm, can this be considered? 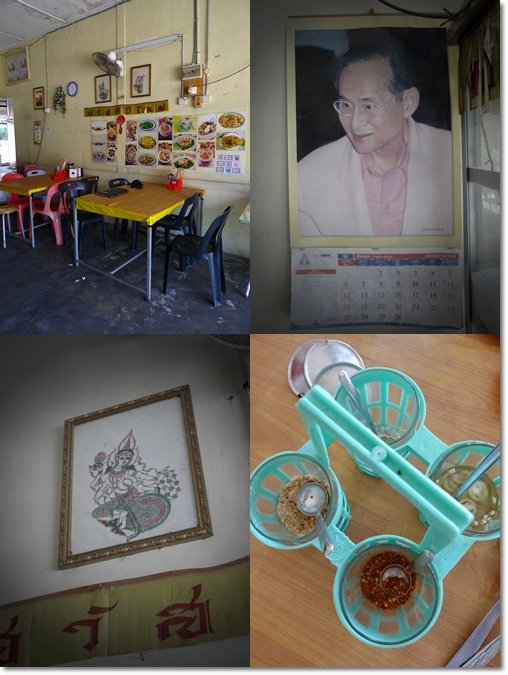 Restoran Waritha – A Thai-Malay restaurant near to Simpang Pulai town. And the Assam House’s, and Kim Bali’s which I’ll be getting to … later. There are so many Fridays, no worries …. 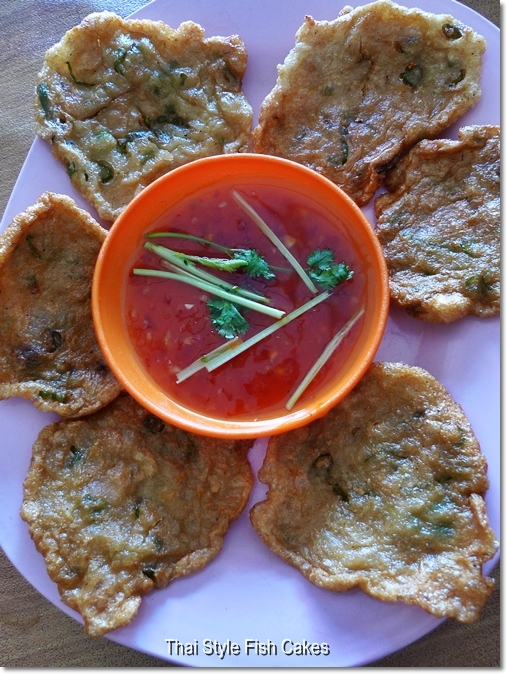 I had the same deep-fried kangkung as well, served with a dipping sauce of Thai chili sauce. Soon, it’ll all be Go East … hehe …. But I can’t stand eating under the scorching heat. How?? :( maybe I can only visit during dinner. The Tom yam hung is enough attraction for me. You over ordered and it’s still RM30?? Geez…I should stay in Ipoh!! RM30 considered cheap huh? But there are STILL people who think that RM30 for a meal for two is exorbitant! That is a real bargain of a meal! And yes, can’t beat the Thai paraphernalia to amp up the experience! We passed the HEAT test, hurray! Nah … wasn’t exactly spicy to begin with, right? And funny thing was, the boss did mention about most customers complaining about the heat, hence they tone down to suit locals’ tastebuds. And they took out the Thai style Braised pork knuckle, fish maws in soup, and many others just because the locals did not seem to appreciate the flavours. I’d say, BRING IT ON! For being as authentic as authentic Thai cuisines could be, I don’t mind a serving of the most pungent, robust, or fiery Thai delight for once. Thai Xiang? 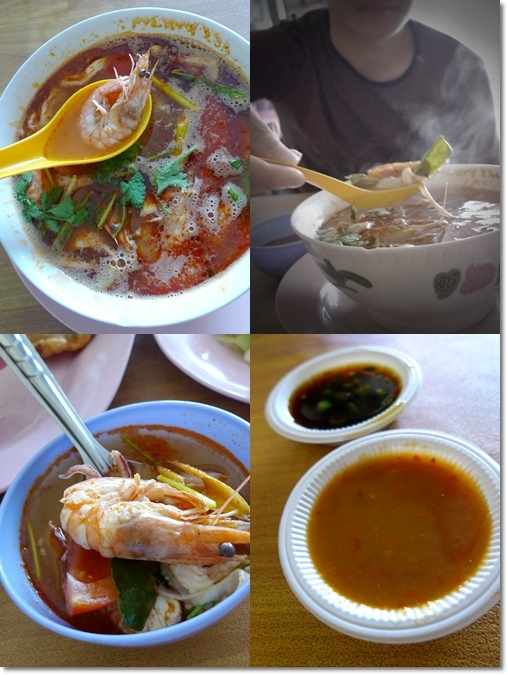 Theirs was damn spicy … I still think Nakhon Pathom’s the BEST. But sadly.. no more. Hmm … so have to make do with the others. Common Sense said it best, “correlation does not equal causation”. Generalization by a genre is a failed method to make an association, though there most certainly is not a direct one in the first place. That aside, within each genre, individual artists make music of varying degress of complexity. For example, many could argue that a lot of techno is 4/4 monotony, but some some artists make incredibly complex music e.g. Venetian Snares, which you could argue that the apparent ‘randomness’ (chaos is more appropriate something that appears random, but is in fact deterministic) would cause your brain to be more active or aware this may be a better type of music for thinking abstractly. I’ve been browsing online more than 4 hours today, and this is the best article I’ve come across. I’m a blog post fiend so I’ve actually read a lot already.Personally I think, if all webmasters and bloggers made as awesome content as youhave, the internet would bea lot more useful than ever before.